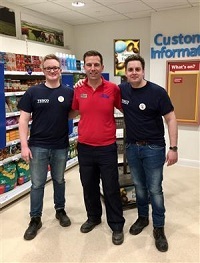 Cheshire Fire and Rescue Service has announced the launch of a partnership with Tesco at Safety Central, its new safety and lifeskills education centre in Lymm. Safety Central will educate people across Cheshire, Halton and Warrington on all aspects of safety in the community. Tesco has installed a realistic mock store complete with till, stocked shelves, baskets and Tesco livery as part of the Safer Choices section of the centre. Children and young people will complete activities aimed at helping them to budget, recognise healthy and less healthy choices and understand the law around age-restricted products. Adults with specific needs can use the store to help practice the skills they need to live independently. The store forms part of a series of interactive scenarios encouraging groups to consider the consequences of their decisions, including a police custody suite, courtroom and interactive e-safety classroom. Safety Central is part of a £4 million investment by Cheshire Fire Authority in community safety. The striking circular building, which is located opposite Lymm Services on the A50, features four interactive hi-tech learning zones, designed to simulate the most common avoidable harms in the community. The centre’s free education programmes have been designed to help those most at risk recognise dangers and gain the skills and knowledge to stay safe, well and independent. It will open its doors this September and more than 3,600 young people from across Cheshire, Halton and Warrington are already booked to visit. Deputy Chief Fire Officer Mark Cashin said: “We’re aiming for Safety Central to be the best facility of its kind in the UK and the support of organisations like Tesco is vital in making our educational scenarios as realistic as possible.